The third evening was our evening for the Pacific Rim Cuisine at Animator’s Palate. 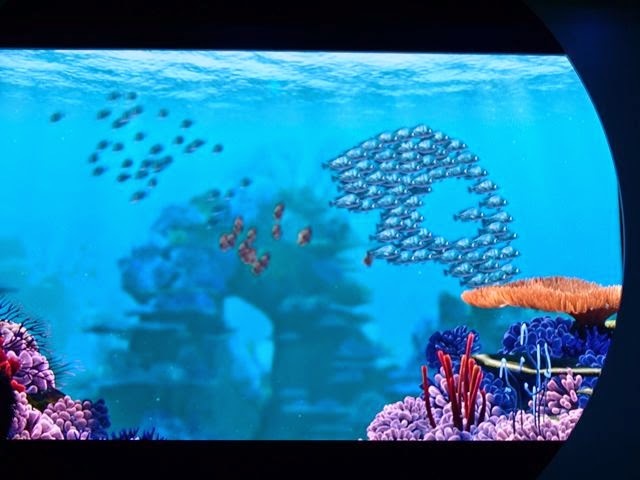 The Finding Nemo theme with Crush and the screens doing the shapes with the fish is interesting, but as a Sorcerer Mickey fan I much prefer the original Animator’s Palate show. Yeah, you kind of got that on our second visit, but the way the original Animator’s slowly goes from black and white to color is much more interesting in our opinion. Mik decided to try the evening’s specialty non-alcoholic cocktail, which was called the Bora Shake. He has tried a couple different specialty cocktails on the cruises over the years, but his favorite has always been the Lemonaska from the Alaskan Cruise. 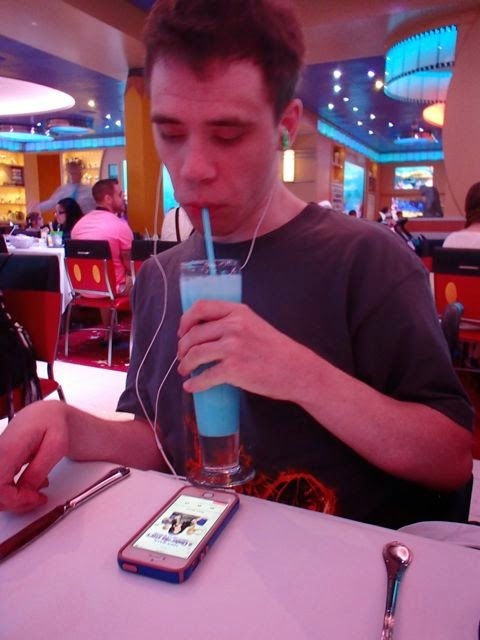 That is it was his favorite until he tried the Bora Shake, which is now his favorite he’s had on the Disney Cruises. Mik had the Black Truffle Pasta Purseittes for his appetizer, which must have been really good because I never even got a chance to take a picture of it. 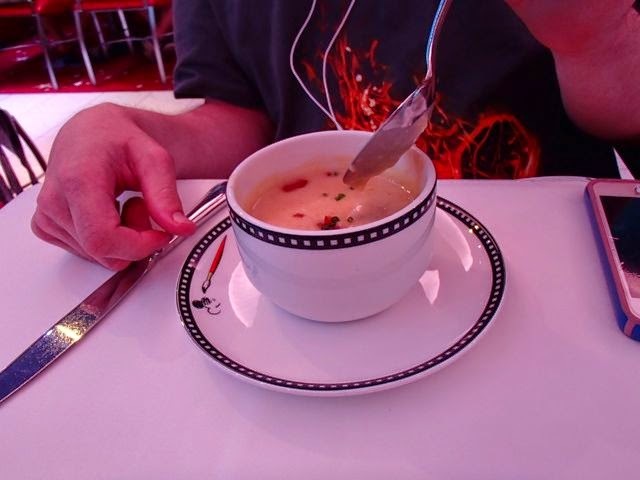 For the soup/salad course, he had the Baked Potato and Cheddar Cheese Soup, which he only had a few bites of because he thought it tasted too much like nacho cheese. 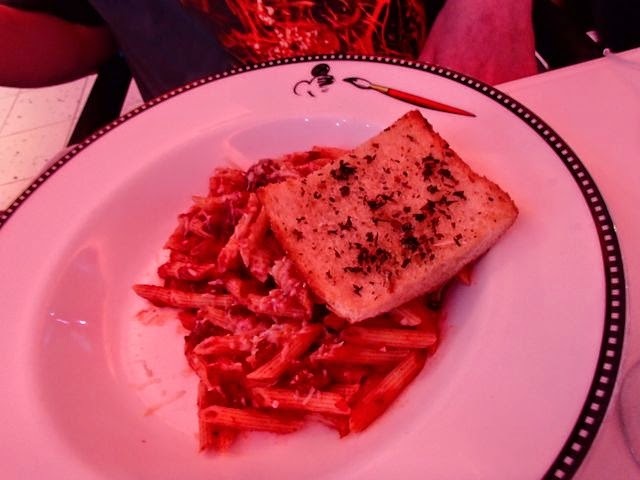 For the main course, he had the Pennete Bolognese, which he also did not really like. I had the Seared Red Snapper, which both him and Dad tried a bite of and they both wished they had got that. 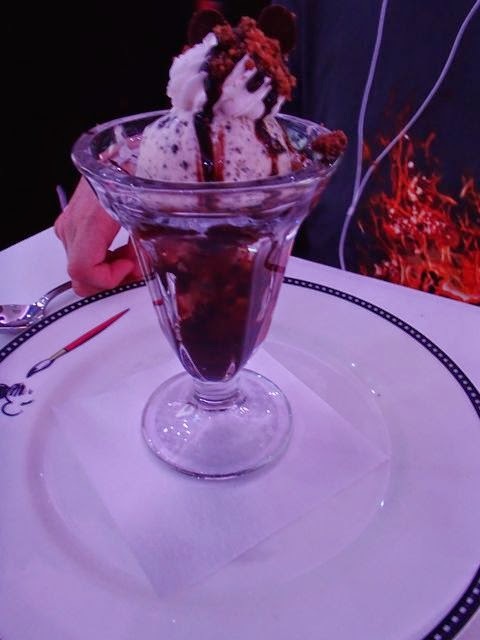 His soup and main course selection might have been duds for him, but his dessert selection was a guaranteed good one, as it was his favorite sundae (Cookies & Cream). 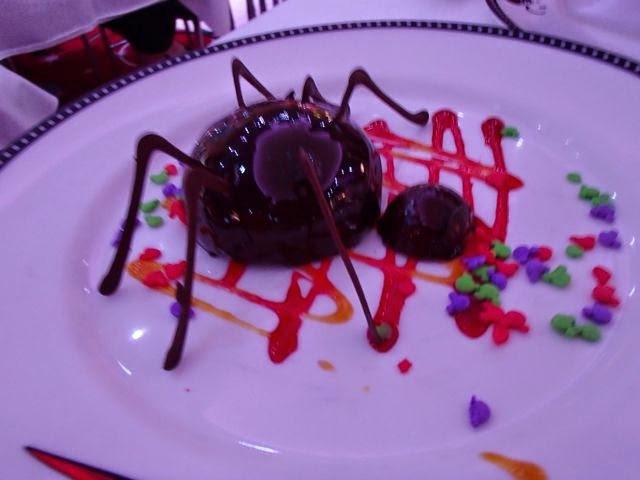 We also got a special Spider chocolate mousse dessert since it was the Halloween evening on the ship.